Van den Bos exports its lily bulbs to more than 60 countries throughout the world. We deliver lily bulbs grown in the Southern and Northern hemisphere, which puts us in a position to guarantee a year-round supply of good quality bulbs. We also sell many varieties of lilies on an exclusive or semi-exclusive basis. Van den Bos is a household name in the field of preservation, preparation, trade and export of lily bulbs. Service and quality enjoy top priority, which is clearly reflected in our final products. Our representatives are genuine specialists and they can support you with personal growing advice to ensure that you can always get better quality flowers. One of our strengths is access to excusive or semi-exclusive varieties that allow us to offer a distinctive range. With our Southern hemisphere production facilities we can also deliver our top quality lily bulbs for cut flowers and pot plants year-round. Van den Bos customers produce cut flowers and potted plants from our lily bulbs. 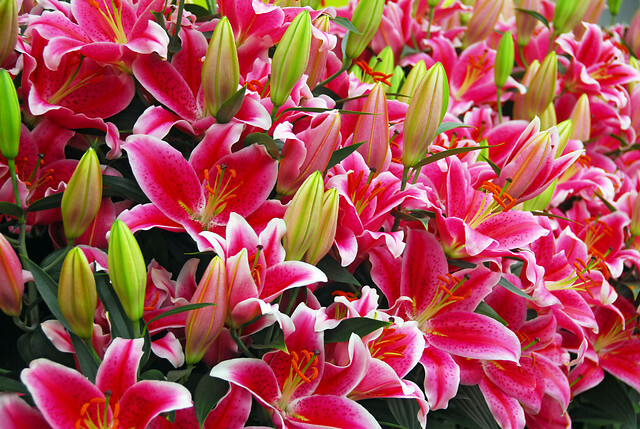 We have over 380 varieties of cut lilies and 60 varieties of potted lilies available in our assortment. Our varieties are available world-wide, suitable for all types of climates. Discover our latest varieties at events and in our trial greenhouse during June. Check out our calender to make sure you do not miss an event!